Sanjaya and Haley are safe, Chris Sligh is gone… Next week: Tony Bennett songs. Who will leave their heart in San Francisco? VK is having a Sanjaya Edition Caption Contest! Tell her we sent you. I went from the living room to the kitchen to heat some water for tea and unexpectedly came across this airport sitting on the floor in front of the refrigerator. 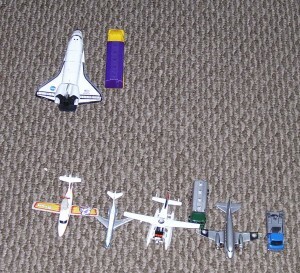 I often come across an unexpected airport or parking lot in my home. That’s one thing you get when you have a six-year-old boy in the house.